When I first came to Silicon Valley the world of Venture Capital looked pretty simple. VC’s invested in things that ran on electrons: hardware, software and silicon. While individual VC’s inside venture firms specialized in particular domains (PC’s, peripherals, semiconductors, test equipment, operating systems, applications, etc.,) their investments had roughly the same time horizon and were focused around things that used electrons – primarily computing and computing infrastructure. The VC business took off with the rapid growth of the semiconductor business. Fairchild Semiconductor became the progenitor of a flood of Silicon Valley chip companies and at the same time the adoption of the limited partnership as the model for Venture Firms gave VC’s their own profitable business model. The personal computer business was built on top of the semiconductor business about the same time that the last of the pieces of Venture Capital were falling into place – the 1979 change in the EISRA “prudent man” rule allowing pension funds to pour billions into Venture Funds. Here’s what the start of Valley chip business looked like on a genealogy map, tracing most all of its DNA back to the first Silicon Valley chip company, Schockley Semiconductor. In 1980 Genentech became the first IPO of a venture funded biotech company. The fact that serious money could be made in companies investing in life sciences wasn’t lost on the venture community. But the knowledge that VC’s had built investing in electron-based companies didn’t translate to expertise in cell-based or cell-proximate companies. The technologies were different, the time horizons were different, (2 to 5x longer to take a drug through FDA trials ~14 years,) and the regulatory environment was different (barely any in traditional VC investments compared to FDA trials for drugs and 510K approvals needed for medical devices.) Finally the amount of capital needed to take a drug to FDA trials could be enormously expensive, at least 10x more than startup costs at an electron-based company. The two watershed events for biotech startups were the Bayh-Dole Act of 1980 and the Orphan Drug Act of 1983. Bayh-Dole allowed for private ownership of government funded intellectual property developed in universities while the Orphan Drug Act created incentives for developing drugs for disorders afflicting fewer than 200,000 Americans. For a few reasons, I’ve been struggling to make sense of all the noise happening in what others have called the Super Angel arena. First, my students are confused about who to talk to and how to think about funding their consumer internet startups. Second, and full disclosure, I’ve invested in a few of these funds; and third my teaching partner Ann Miura-Ko is a partner in one of these funds. My take is that we are watching an entirely new category of Venture Capital firms emerge. It is as an important a split as when the biotech guys hung out their shingles. Consumer Internet startup investors are now their own category. I call them “Lean VC’s” to emphasize why they’re different. These startups embrace customer and agile development that Eric Ries has been evangelizing. They build a minimum feature set. Quickly iterate the product in front of customers. Along with Lean VC’s a new class of angel investors has emerged. YCombinator, Techstars, et al, have been described as incubators but in reality they are the new “Lean Angels.” These angels “get” the sea change happening in Internet Commerce. 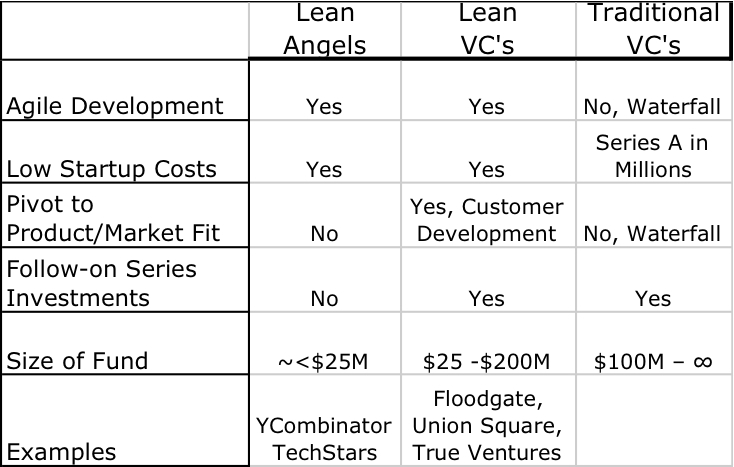 The difference is that unlike Lean VC’s, these angels help their startups rapidly develop the product, but typically don’t add much help in developing the market/customers. And while they provide the initial investment they rarely follow-on with the Series A dollars needed for scale. They’re a great feeder system for the new class of Lean VC’s. Steve Blank is a retired serial entrepreneur and author of Four Steps to the Epiphany. He teaches entrepreneurship at various universities, including Stanford University’s Graduate School of Engineering and UC Berkeley’s Haas School of Business, and maintains a very informative blog about the startup space. Great article. Nice. Thanks for sharing! Well this way of information is really value in look for of, efficient information for guests and a value for you as will definitely show the amazing of the writer. It’s awesome to have these kinds of articles around to keep information action ongoing. Helping those who really can create elements right later on, awesome work! When I first came to Rubberized Place the globe of Project Cost-effective dedication seemed apparent and apparent and clear and understandable. VC’s spent in aspects that ran on electrons: elements, system and rubber. While personal VC’s within venture organizations particular in particular websites their cost-effective.